Hi everyone! A Blog Named Hero and Wplus9 are mashing up this week over at ABNH. WPlus9 is known for classic designs with a fresh, modern spin. Dawn, the talented illustrator & owner also offers coordinating dies, beautiful cardstocks and even inks. This first one is pretty straight forward. 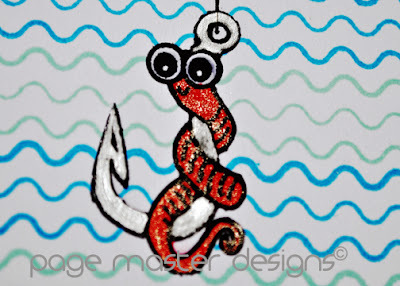 I stamped the worm on the hook and then masked him and used the ocean waves on the back in pool and tide pool. I colored him in with a Copic and added some Wink of Stella to him to give him some shine. I used a Krylon Silver leafing pen on the hook. This next card is for my husband. Our anniversary is next week. He's always been into fish tanks so I thought I would make him one that is very low maintenance. I started by cutting out a fishbowl with my Silhouette. I cut it twice of acetate and twice out of double sided adhesive. I used the internal offset on the ones cut out of the double sided adhesive so that I could just have the rims to add glitter to. The front and the back of this card look EXACTLY the same. 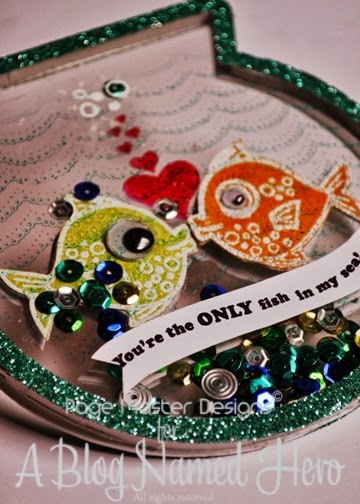 I also made this a shaker card so that I could add a bunch of sequins to the bottom of it. 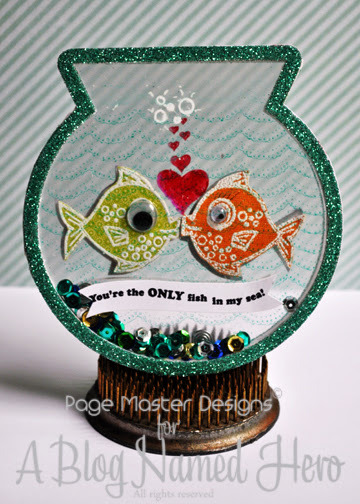 I stamped the acetate only once with the Lacey Background by Hero Arts. 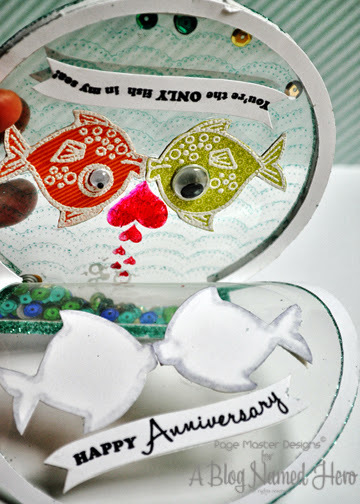 I stamped the fish numerous times on patterned paper with White ink and heat embossed them. I had to reverse the image like I did in THIS post to get the fish facing each way. The Banner came from Simon Says Stamp. It's stencil. I just traced it, cut it out and then bent the stamps to follow the swish of it. 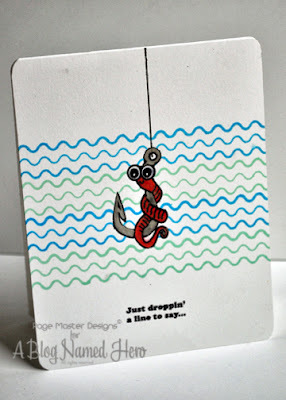 The inside of the card has 2 blank fish for me to write on. I also stamped some hearts and some air bubbles popping. If you have any questions please don't hesitate to ask. Have a wonderful day. Please stop by A Blog Named Hero to see what the other girls have done and don't forget to go to Wplus9 and see all the FAB stuff available. I have more Wplus9 cards coming soon!